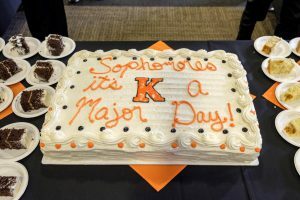 Declaration of Major Day is a festive gathering where sophomores designate their majors, minors and concentrations at Kalamazoo College. There are two camps of students who come to college: those who know exactly what they want to study — or are pretty sure they know — and those who don’t. 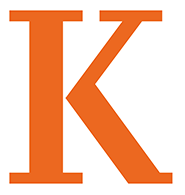 Kalamazoo College takes a different approach to helping students decide their major. Through the K-Plan, students explore and discover academic fields for a year and a half before choosing a major. Best of all, the curriculum is designed to give students this freedom while keeping them on track to graduate in four years. 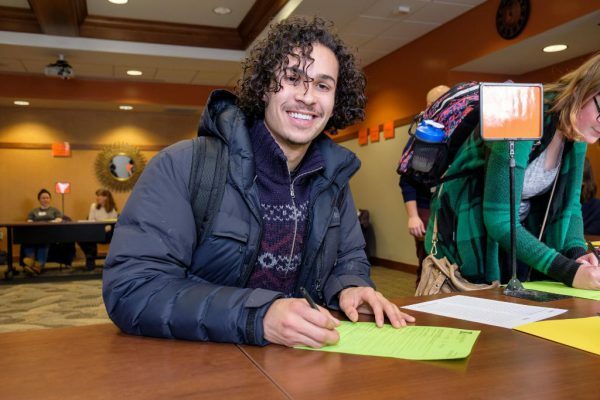 This past Wednesday’s Declaration of Major Day, the midpoint of their sophomore year, was a festive gathering where students formally designated their majors, minors and concentrations. The banquet hall at Hicks Student Center was packed as each department set up a booth. Students went from table to table, committing to their fields of study and getting stickers declaring their choices. They celebrated the big moment with one another and the rest of campus with a piece of cake baked for the event by Dining Services. Sophomores celebration Declaration of Major Day with a cake from Dining Services. Jansma also said it’s a way to celebrate students finding their academic home. “It is a real rite-of-passage for sophomores,” she said. K senior Emma Eisenbeis, a political science and German double major, recalled the excitement of her Declaration of Major Day. “This event gives you the opportunity to situate yourself in your academic community with your fellow peers and faculty. It really hits you that this is the start of your career path,” Eisenbeis said. This event typically merges the two camps of students into one, where they all have a sense of where their paths are headed. And if something changes, no worries. Thanks to the flexibility of the K-Plan, the College will work with students to make a switch of major or majors as seamless as possible. This entry was posted in News Stories and tagged K-plan, students, . Bookmark the permalink. Julia is the Assistant Director of Marketing and Communication, specializing in Financial Aid and Admission. She shares stories that distinguish Kalamazoo College as a leading liberal arts college. Contact her at jroberts@kzoo.edu.